While trying to come up wih a very simple parve dessert to follow a meat dinner, I vaguely recalled making a vegan rice pudding awhile back.. But since I was already serving rice along with the brisket, I didn't want to serve another rice dish, even if it's dessert. Then I remembered how I recently stocked up on couscous (sale + double coupons = woo-hoo!). Couscous according to wikipedia, is made from semolina. 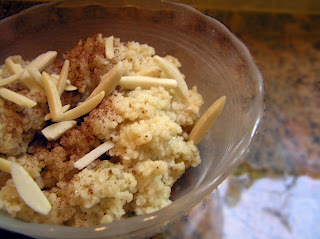 Semolina, according to wikipedia, is made from wheat middlings. Wheat middlings, according to wikipedia, is made from stuff you don't really want to know about. In any event, couscous pretty much cooks itself-- the only thing you have to watch is the water boil. So I tweaked the rice pudding recipe ever-so slightly to come up with this slightly sweet version. Shanah Tovah! In case you still haven't decided on what to serve for Rosh HaShana, here are a few suggestions. Every recipe in this post is easy to make. Even your most jaded guests will be so impressed they will think you spent days cooking up a storm. Start off the meal with some traditional Apples and Honey Slices and dip some challah along with it! Honey-Mustard Chicken is delicious enough for everyday, yet elegant enough for a holiday dinner. But nothing says elegance as tender Orange Cornish Hens. Carrots and honey go together like, um, Honeyed Carrots. If you still have some honey left over, try Fruit Salad with Honey-Lime Dressing. I made this recipe so long ago that I can't remember anything to blog about. But it's easy enough for a weeknight dinner, yet elegant and special enough to serve for Rosh HaShana. Preheat oven to 350F. Pound the chicken breasts to flatten and make even thickness. Lightly grease a rimmed baking sheet with olive oil. Arrange breasts in a single layer. Brush honey-mustard dressing over the breasts. Try to brush more evenly that I did. Bake breasts until golden brown, and when you cut into the middle of one the juices run clear and there is no pink remaining. Individually plate the breasts. Serve hot with your favorite veggie or two Oh, yum! I like traditional holiday dinners. The familiar smells and tastes of special meals served to special family. But sometimes I'm just chickened or brisketed out. 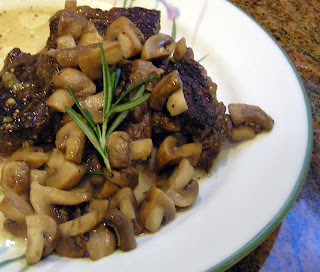 So when I found The Pioneer Woman's recipe for short ribs, I almost plotzed with delight! Flanken ... short ribs ... same difference. I thought each was a ribbon of ribs cut across the bones, about 4-5 or so little ribs in each length, as opposed to normal ribs, cut between each bone. Lemme tell you, 2 per of these little things is just an h'ordeuvre. I think the butcher had a pile of tiny riblets to get rid himself of and had a bright idea to package and rename them. But since he was sold out of flanken, I bought 3 packages of this instead. The end result was still very good, as you will see in the photos later, but I think the presentation would be better with flanken ribs so flanken became the recipe name.